One of the best descriptions of Maria Luisa Borbone [Bourbon], who was the Infanta of Spain, Queen of Etruria, and reigning Duchess of Lucca, that I have ever read, was written by Mario Tobino (writer, poet, psychiatrist, born in Viareggio, province of Lucca, in 1910) and can be found in his collection of short stories entitled “Sulla spiaggia e al di là del molo”. I don’t know whether it’s the best description because, if my memory doesn’t fail me, most written accounts usually depict Maria Luisa’s more conservative aspects: her excessive religiousness, her absolutism, reactionism, and devotion to church and family. Nonetheless, she brought to fruition many of the ideas and projects of her predecessor, Elisa Bonaparte, with an enlightened spirit despite the fact that she was more of a reviver/restorer. No mean feat. Some of her accomplishments: schools for young men and women, the Botanical Garden, roads, the aqueduct, the reclamation of the marina and consequently the creation of Viareggio and modern-day Versilia. I’m pleased that Mario Tobino took it upon himself to look at the woman beneath the surface of the reviver/restorer. He wrote about her back in the day (1966) when things were less complex and we weren’t as suspicious of everything as we are today. Nowadays, it seems we lie in wait for sordid facts to be unearthed about some important person’s real life as opposed to their official life. Paraphrasing Tobino’s words, Maria Luisa arrived in Viareggio as an austere and inscrutable “queen”. She embarked on her white and gold sailing ship of majestic bearing and while navigating, she put prayer, religion, and severe court etiquette on hold. The sea was a delightful surprise and she was delightfully surprised by her reaction to it. On the admiral ship, what was fascinating was the expanse of the sea and its mysterious ports. This portrayal sums up her character perfectly. 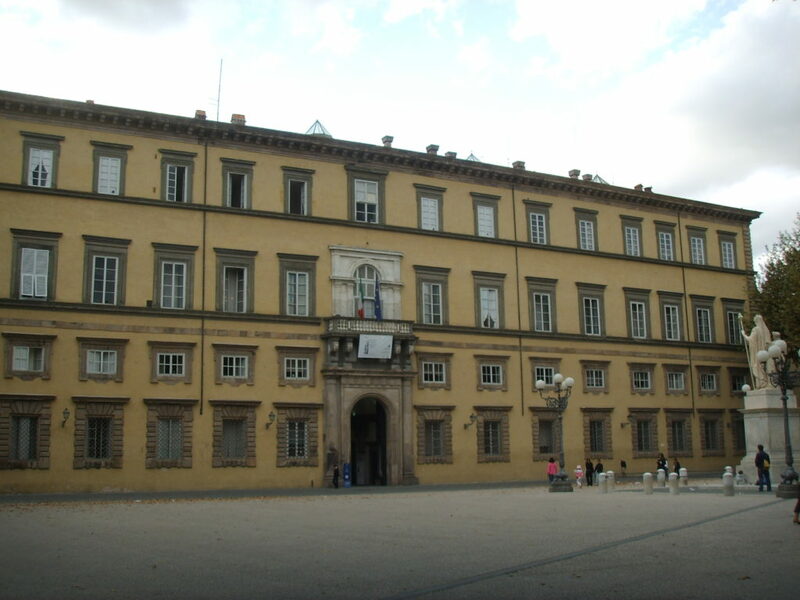 Maria Luisa was installed as the Duchess (of the Duchy) of Lucca on 7 December 1817. This spring, you might like to take part in one of our guided tours in honor of this 200th anniversary. 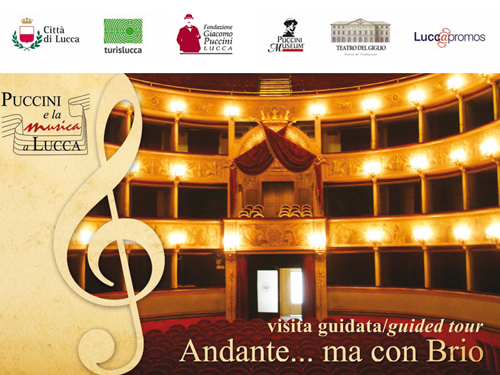 You can visit the various places tied to the Bourbons of Lucca and province or take part in some of the events organized by the Association “Napoleone ed Elisa: da Parigi alla Toscana”. A good place to start is by going to ‘introduce yourself’ to the duchess. Maria Luisa, in the role of a white marble water deity, is located in the center of Piazza Napoleone. In honor of the two powerful women who reigned in Lucca in the first part of the 19th century, Elisa Bonaparte and Maria Luisa Borbone [Bourbon], the “Theatre of Elisa” is open through to March 8. A bit of imagination is needed to immerse oneself in the ambience of that time period, and I would have preferred a more robust intervention, but Beatrice Speranza’s presentation is nonetheless very suggestive and recreates, with grace and delicacy, the staging of that era. Next to the rooms of the theatre, there is a small exhibit, a “sensory journey” through the gardens and streets of Lucca in search of scents and fragrances typical of the 19th century, organized by Roberta Martinelli, Simonetta Giurlani Pardini, and Paolo Emilio Tomei. The Fountain of the Pupporona in Piazza San Salvatore (aka Piazza della Pupporona or Piazza della Misericordia) is the most elegant drinking-water fountain of the 19th century Nottolini aqueduct. 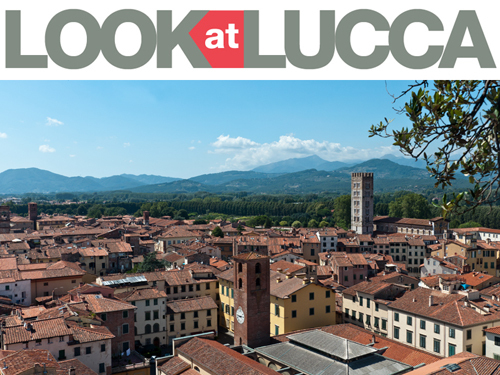 The water source is located south of Lucca in the Pisan hills and the aqueduct brings fresh, clean and good-tasting drinking water to Lucca. If you want to mix with the locals, bring an empty glass bottle (or two), fill it up and drink it rather than buy bottled water. If you feel like taking a walk, you can head for the water source by strolling on the trail alongside the arches of Nottolini’s aqueduct. 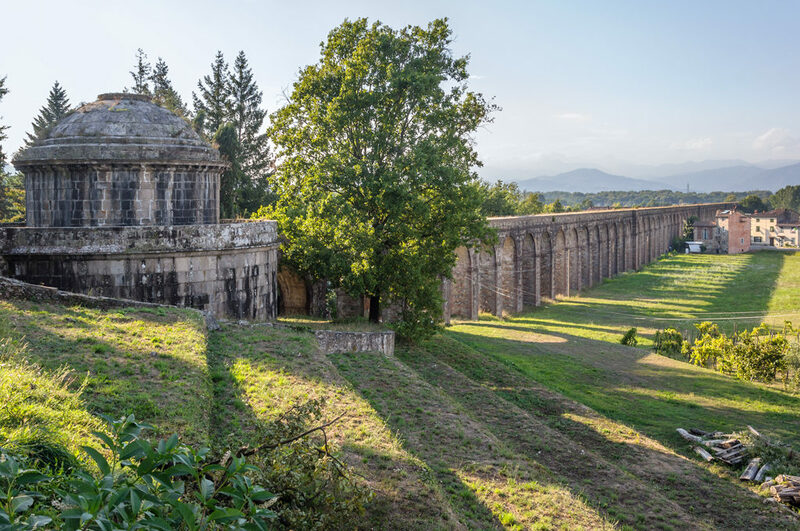 (Go to the tourism portal of the Comune of Capannori and choose the links regarding the aqueduct and water route.) From the temple/cistern in San Concordio, located behind the train station, you can walk through the beautiful countryside to the area called “Parole d’oro” (literally “Golden Words” so-named by the locals due to the inscription in gold-colored letters on a small bridge nearby). This area and the aqueduct are architecturally noteworthy thanks to the great mastery of the architect/engineer Lorenzo Nottolini. In the spring, we’ll talk more in depth about him. If you like the mountains, take the Dukes’ Route (Strada dei Duchi) from Bagni di Lucca to the Giovo Pass. One of the dukes was, of course, Maria Luisa, Duchess of Lucca, and the other was Francesco IV, Duke of Modena. They decided to directly connect their two duchies through the Apennines. A crazy and marvelous route with breathtaking panoramas: it runs along the natural reserve, Orrido di Botri, the largest and deepest canyon in Tuscany. One can envision carriages hurrying back and forth between the two cities for business matters regarding the two territories. If you like the sea, you must visit the Palazzina Borbonica at Torre del Lago. Maria Luisa and Nottolini had an ambitious project in mind: to build an imposing property worthy of a royal court to emphasize Maria Luisa’s absolutism as sovereign. The property no longer has such a regal feeling, but is still noteworthy. It can be visited through the Associazione Ville Borboniche della Versilia (http://www.associazionevilleversilia.com/). The association organizes guided tours of the residence led by role-playing characters in period costume and also holds period-costume parties and events. To complete your stroll with Maria Luisa, you can visit Piazza San Francesco on Wednesday evenings when poets of the Accademia Teresa Bandettini gather to perform. Teresa Bandettini was a poetess of the court of Maria Luisa. These poets are called of the “ottava rima” which is a rhyming stanza form that originated in the late 13th/early 14th centuries in Tuscany. It was originally used for long poems on heroic themes and then became popular even when writing mock-heroic works. To finish off the day, a glass of red wine and a meal in one of the nearby trattorias is a must. Posted in Blog ed etichettato Lucca, Maria Luisa di Borbone, Mario Tobino, Nottolini, Torre del Lago, Viareggio. Bookmark the permalink.